Sugarbag Spirits walk about on the land during the night and hide under water during the day. They stopped at particular sites in Ankung Djang country, some of which are associated with different types of honey. The art of Bardayal ‘Lofy’ Nadjamerrek is steeped in the tradition of rock art. 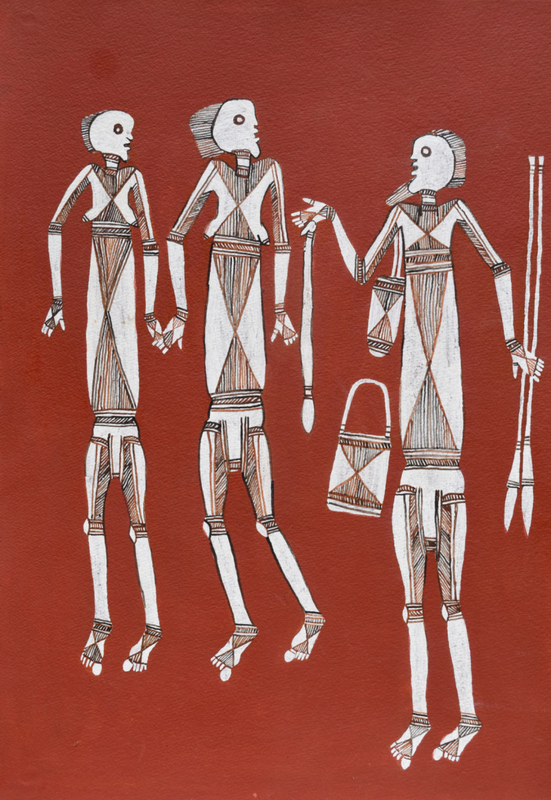 He is a celebrated master of the ‘x-ray’ style of painting, ofen representing the organs and skeletal structure of various spirit figures; animal species, including kangaroo, emu, crocodile, goanna; as well as local flora. His distinctive red cross-hatching and meticulous parallel line work dazzles the eye. of fine white lines set against the red ochre background to paint the spirit beings, fauna and flora of her grandfather’s country, often in his specific “Stone Country” x-ray style.